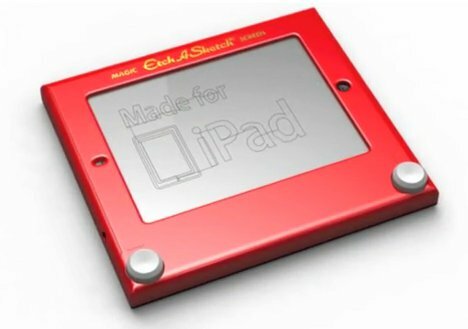 The Etch-A-Sketch, that iconic bright red drawing toy from your childhood, is making a comeback – but in a much-improved digital format. 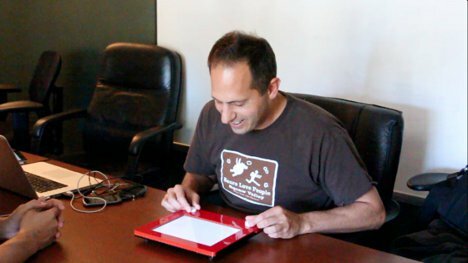 A small startup plans to sell an iPad case that will make your expensive toy look just like the cheaper one, with an official app to make it work just in the way you remember Etch-A-Sketches working. 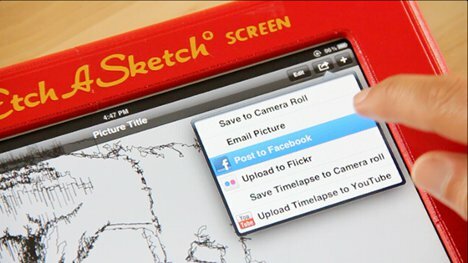 It’s called Etcher and it’s got the blessing of the company that made the original Etch-A-Sketch. The team is working with an Etch-A-Sketch artist to ensure that the knobs work and draw in a way that is faithful to the original. That means you’ll have the same limitations of drawing only straight lines and having to figure out how to get the line to move in curves or diagonals. But after you figure it out and make a retro masterpiece, the high-tech iPad interface lets you save or share it. And if you’re especially proud of your method, you can share a time lapse of the creation of your artwork on YouTube. True to the toy on which it is based, the Etcher even lets you shake to erase your drawings once you are finished. Thanks to the official app, you don’t even need to jailbreak your iPad to use this awesome toy with it. This is one of the best examples we’ve ever seen of nostalgia mixing with technology to make a product that is appealing to kids and adults of all ages. See more in Computers or under Gadgets. May, 2012.